Please say hello to Teddy. 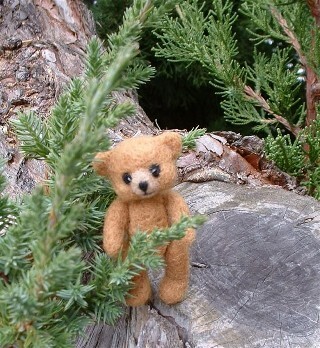 This cuddly little bear stands at a wee 2 ¼” tall. 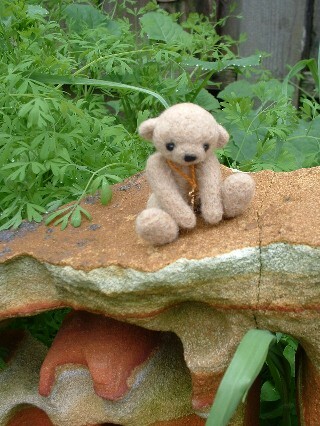 He was firmly sculpted and detailed from a natural, autumn gold wool roving. He features black onyx eyes, which have been shaded for expression. 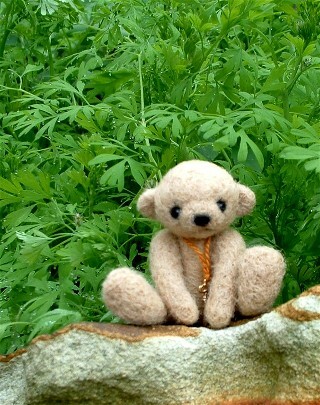 Teddy is 5-way string jointed, so he can be posed in many adorable baby bear ways! 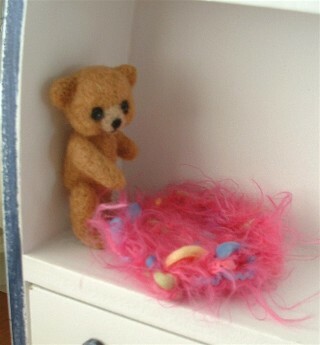 He would make a wonderful addition to a dollhouse, room box display or as a delightful teddy bear companion for dolls. Teddy is displayed with the lovely Greta, by repaint artist Mary Lou Lens. She is a Barbie/Obitsu doll hybrid, so she's just about 10" tall. She is here to give you a better idea of Teddy's size. PLEASE NOTE: Greta is NOT INCLUDED with Teddy. 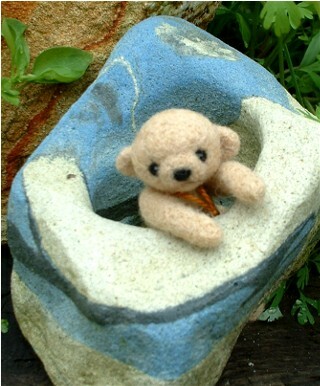 Teddy will be gift wrapped in a swanky acrylic display case, along with a certificate of authenticity. Please say hello to Oliver. 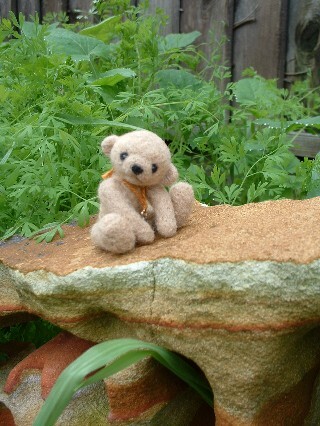 This cuddly little old fashioned bear stands at a wee 3” tall, and only 2 ¼” sitting down. Oliver was firmly sculpted and detailed from a natural, blonde wool roving that has a rough texture, which gives him a charming, old-world teddy look! Oliver would make a wonderful addition to a dollhouse, room box display or as a delightful “antique” teddy bear companion for dolls. Oliver is shown with a couple of Fashion Royalty dolls, to give you a better idea of his size -- They are not included! Oliver will be gift wrapped in a swanky acrylic display case, along with the key and certificate of authenticity.